Home > Treatment > What Are Aldosterone Antagonists? 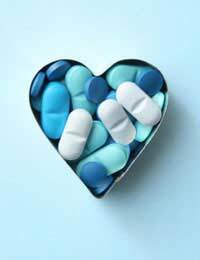 Aldosterone antagonists are drugs that are often used to treat heart failure. This occurs when the heart becomes damaged and then cannot act as an efficient and effective pump. Failure of the left ventricle leads to left ventricular heart failure, which causes swelling in the legs, feet and ankles, and general tiredness. When the right ventricle fails, the most common symptoms are breathlessness and tiredness, as blood is not pumped efficiently to and from the lungs. Without treatment, heart failure becomes worse over time leading to severe disability and a loss of quality of life. Using drugs to eliminate some of the worst symptoms and to help the heart to work as hard as it is able to can really help make a big difference. This means that the drugs work on the kidneys to stop so much sodium being absorbed from the fluid passing through the kidneys. This helps to reduce the amount of sodium that is excreted in the urine, which allows more water to pass from the blood, causing diuresis – the production of greater volumes of urine. As more water is leaving the body, this reduces the swelling in the legs, feet and ankles in people with left ventricular heart failure, and also reduces the excess fluid on the lungs of people with right ventricular heart failure. Reducing the overall volume of the blood also helps to relieve some of the strain on the heart, which often enlarges in heart failure to try to compensate. Aldosterone antagonists basically block the action of aldosterone, a hormone that acts on the kidney to conserve water. Preventing this activity stops the body conserving water, allowing blood pressure and blood volume to fall. Although they are mainly used to treat heart failure, they can also be used to treat high blood pressure. The first aldosterone antagonist to be developed to treat heart failure was spironolactone. More recently developed additions to the drug class include eplerenone, canrenone, prorenone and mexreonone. Eplerenone is often used to treat people who have had a serious heart attack that has damaged the heart so much that it starts to fail. People with left ventricular heart failure can benefit from greatly reduced risk of another heart attack, and of dying from the effects of their initial heart attack, if they are given eplerenone within 3-14 days. This class of drugs are described as a useful ‘second line treatment’ for heart failure. This means they are often given as a second drug, together with a first choice treatment, to reduce the symptoms of heart failure and to also treat other conditions such as high blood pressure. The older aldosterone antagonist spironolactone has more side effects that the later drugs in this class that have been developed. Spironolactone can lead to changes in secondary sexual characteristics in women treated with it for heart failure – often their voice becomes deeper and their pattern of body hair growth starts to resemble that of a man. Some women also find that their periods become very irregular. Men treated with this drug can also suffer hormonal effects – and they can develop female characteristics such as breasts, which can become quite painful as they enlarge. Aldosterone agonists all decrease the amount of potassium that exits the body in the urine, so they must not be taken with other types of diuretics or with drugs to treat fungal infections, as the level of the potassium in the blood might become dangerously high. People given this class of drug are advised not to eat foods that are particularly high in potassium, as this makes the problems worse. Foods such as fruit juice, poultry, fish, beef, fresh fruits and dried fruits must all be cut out of the diet, leading to a very restricted range of foods that can still be enjoyed.